Drawing Hands is a lithography by M.C. Escher which dates back to the year 1948. This print shows a sheet of paper where one can see wrists drawn. Out of these flat wrists, three dimensional hands come out, which hold a pencil each and seem to be drawing one another. M.C. Escher is renowned for his innovative works of arts. He likes to make one look into the details of the prints and think about what they mean and their inner explanations. 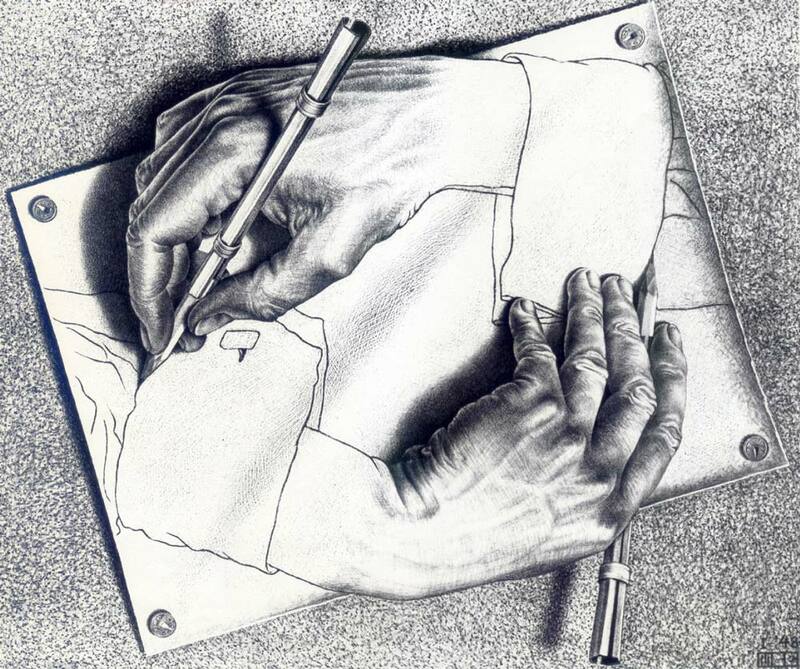 Paradoxical acts are very common in Escher’s prints, and in Drawing Hands it is even more clear and interesting, even though the act itself is simple from a superficial point of view. The fact that he manages to make a one-dimensional part become a three-dimensional one is really fascinating and interesting to look at. The lines flow in such a way that it is actually difficult to imagine how he managed to make them look so natural and realistic.